S.J. 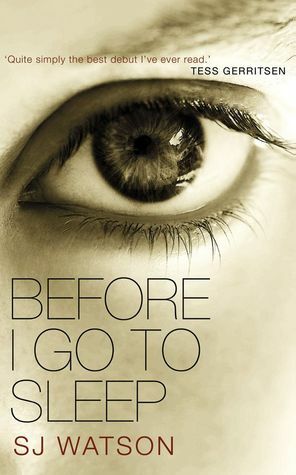 Watson, the international bestselling and an award winning English writer, has penned a tantalizing and a thoroughly anticipating psychological thriller, Before I Go to Sleep that unfolds the story of a woman who wakes up every morning with no clue about her identity or the identity of the man who sleeps next to her or any idea about her life. Everyday is a struggle for her to go through the same introduction and same stories of her past from the only man whom she can trust, but is he being honest about the woman's past life? So what if you lost yours every time you went to sleep? Your name, your identity, your past, even the people you love - all forgotten overnight. And the one person you trust may only be telling you half the story. Well I know it's pretty late to write a review of this book as the movie adaption of the book starring Colin Firth and Nicole Kidman has already rocked the nation. But anyways, it is never to late to curl up with a good book that has created so much positive as well as negative noise in the literary world. For starters, before purchasing the book, I checked out lots of negative reviews, that suggest that the book is highly predictable and must not be read. Well Mr and Miss Smarty Pants out there, you guys might me very intelligent enough to figure out the whodunit, but for fools and stupid people like us, this book definitely kept me guessing till the end. Look at the way Ben behaves around Christine, it is not easy to predict on whether he has trapped a poor soul for his benefit. Anyways, I do not want to disrespect anyone out there. Christine is amnesiac and every morning Dr. Nash called her to remind her about the journal she wrote, without the knowledge of her husband, Ben. But her memories are playing trick, as one be one, snippets of her memory starts unrolling in her head and with the help of the doctor, she can get a brief idea about her past life. But what happens when Ben, her loving husband, gets to know about Christine's conspiracy with this doctor to revive her old memories? The writing style of the author is extremely articulate and has been layered with suspense that will keep the readers guessing till the very end. The tension in the book is very palpable all through out the story. In the beginning, the author gave his readers with a feeling that there might not be anything wrong with Christine's life, but when one by one, Christine's memory start pouring and when it mismatches with the story shared by Ben, then the readers get a feeling like they are gripped with fear and confusion. The mystery is tightly knotted and twisted with turns at every end, but that will only make the readers more puzzle. The story is highly anticipating and the pacing is bit moderate, as same things happen over a prolong period of time, that felt a bit monotonous, but I believe the author was simply trying to make his readers get used to with Christine's daily routines. The narrative is confusing, just like Christine's brain which plays tricks on her mind. The characters are very well-developed, although Christine's demeanor could not warm up my heart or make me feel sorry for her. At times, it questioned me on how a man could take advantage of her failing memory for so long. Christine's voice is honest and the author has done a great job on projecting the voice of a amnesiac patient. How at times, while learning about their true past can engulf them with fear and doubt, how they go to the verge of doing something wrong, these things are well depicted by the author. As for Ben, he is the most adorable and patient husband anyone could ever have. His loyalty towards Christine will bowl the readers over on thinking this man could never do any harm to his wife. Dr. Nash, on the other hand, played an extremely smart role in Christine's life. He is understanding, despite his medical science might at times prohibit from doing certain things, but it felt like he was on a mission to help Christine with her past memories. Memories play another major role in this book. Actually memories play the most important role in our lives, by defining the whole course of our life, based on which our future is shaped up. I can never imagine a life without my memories because I believe I will be nothing without them. Yes this is where Christine made me feel for her deeply for her situation, for her pain and for her constant struggle. Overall, this is the most gripping psycho thriller that I read after a while and that has already bagged so many notable literary awards. Well, if you haven't got time to catch the movie version of it, which released in the year 2014, and is directed by Rowan Joffé, starring a star cast of Nicole Kidman, Colin Firth and Mark Strong, then do give it a watch. Verdict: Definitely a kind of book that got much hype after it's movie adaption. Courtesy: I could have invested my money on buying other notable psycho thriller, I believe! Alas! !